Bring back your fence's beauty while protecting it for years to come with Everseal's professional fence staining service! Having your fence cleaned and stained restores your fence's great looks, and improves the overall look of your home. In addition, it will protect your fence from the harsh weather to ensure it lasts for years to come! The team at Everseal has helped hundreds of St Louis residents refresh the look of their fences! 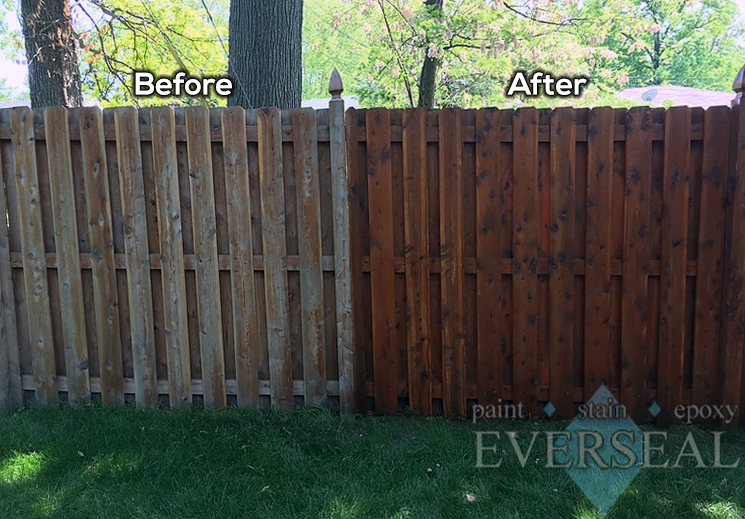 Having your fence refinished may seem like an enormous task, but the expertise of Everseal makes the fence staining process a breeze! First, one of our helpful and friendly team members will meet with you to provide a no-cost, hassle-free estimate for your project. The next step is picking a color, as well as selecting the best type of stain for your project, from transparent to solid. Once we have finalized the project plan, the expert fence stainers from Everseal will get to work! The first step is to clean the fence with our four-step cleaning process, using professional cleaners and brighteners. After allowing the fence to dry, all plants and other surfaces that cannot be stained will be fully covered, and then it's time to start staining! Everseal's team of well-trained and experienced fence stainers properly apply the new stain to your fence, restoring it's original beauty and protecting it for years to come! Why are we the best Fence Staining Service in St Louis? Fence staining is not an easy task, but with years of experience, Everseal has perfected the process! We make the fence staining process headache-free, and we produce excellent results as well! You will be amazed by the transformation that takes place when the pros at Everseal refinish your fence. With expert crafstmanship and an attention to detail, our team will exceed your expectations! Everseal has been offering fence staining in St Louis since 2004, and we are recommended by some of the largest fence builders in the area! We would love to show you why our customers love us, and help refresh the look of your fence! Please fill out the form below for a free estimate, and we will contact you as quickly as possible!